Giving piano lessons as a Christmas gift is a great idea! Reasons why giving piano lessons as a gift for Christmas is a fabulous gift idea! You literally change someone’s life and who knows perhaps their destiny! By giving piano lessons as a Christmas gift, you are doing so much more than simply giving a gift! You can literally change that person’s life and even their destiny! The piano is such a powerful and majestic instrument. Learning how to play the piano can bring a lot of internal joy and satisfaction to the gift recipient. Who knows, perhaps he or she can even become a professional pianist. Or a fantastic and very keen amateur! Giving a gift that can give a lot to someone is a gift worth getting! Learning how to play the piano is a lifelong skill and art form! Once you learn how to play the piano, no one can take it away from you! It is a skill for life! It is also a great creative outlet, and there is a massive desire across the world to learn how to play the piano really well! It is worth noting that learning to play well requires excellent education. Especially when it comes to learning the tough technical parts a musical score. By giving piano lessons as a gift for Christmas, you are giving someone so much more than a simple gift. You are potentially giving someone the skill and the eternal gift of playing the piano! That is priceless and gift worth getting! Giving piano lessons as a gift is very inspiring and very creative! It certainly beats most of the ‘dull’ gifts out there! Let’s face it, it is quite hard to find that ultimate gift! 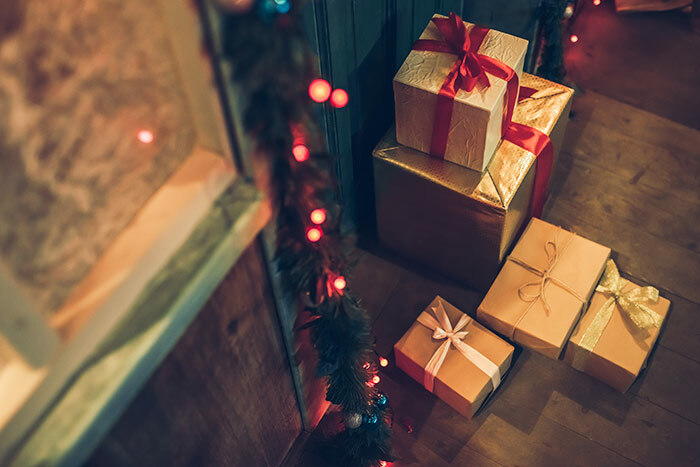 When you do a Google search for “Christmas gifts”, you will often struggle to find an inspiring and creative gift option (that is not kitsch!). There are always good items here and there, but finding something truly special is really really hard! The great thing about giving piano lessons as a gift, is that you give an extremely creative and inspiring gift! You can also rest assured, that the education that will be provided by The London Piano Institute, will be second to none. Once the gift recipient redeems the voucher, they will learn how to play the piano with the right technique without picking up bad habits. At The London Piano Institute, we make sure that everyone receives world-class piano instruction from outstanding piano teachers! Giving piano lessons as a gift shows that you care! By giving piano lessons as a gift, you are showing a tremendous interest in the gift recipient’s passions and hobbies! It shows that you care deeply about that person’s interests! It shows that you went the extra mile to find something really, really good! Something out of the ordinary! It is true, piano lessons as a gift is a gift that keeps on giving! Imagine you offer a five lesson voucher (you can find the details here) to your loved one. Five years later, that special someone is performing beautiful piano pieces with wonderful piano technique! That is a gift in and of itself. Learning how to play the piano has a multiplication effect. It is really the gift that keeps on giving! The bottom line: you make somebody very happy! The fact of the matter is, you will make someone truly happy! Why not take the risk to do that this festive season? By purchasing a piano gift to us, you will make someone truly happy! We will post an exquisite gift voucher to your address of choice, with a personal message on the voucher. You can find details about that here. Imagine your satisfaction when that someone special in your life learns how to play the piano really well! Imagine how great you will feel when he or she learns how to tickle the ivories to absolute perfection! Do something different this Christmas, and offer a gift that just makes sense! Receive a beautiful gift voucher! If you purchase a piano gift voucher with The London Piano Institute, you will receive a beautiful laminated gift voucher that you can present as a Christmas present. Unlike a lot of mechanical vouchers, we add the personal message to each and every voucher and make sure that the spacing looks good for your unique and special message. The voucher will be sent out to you first class by post. Alternatively, we can also send a PDF gift voucher if you need the voucher immediately. Please visit our gift voucher page. 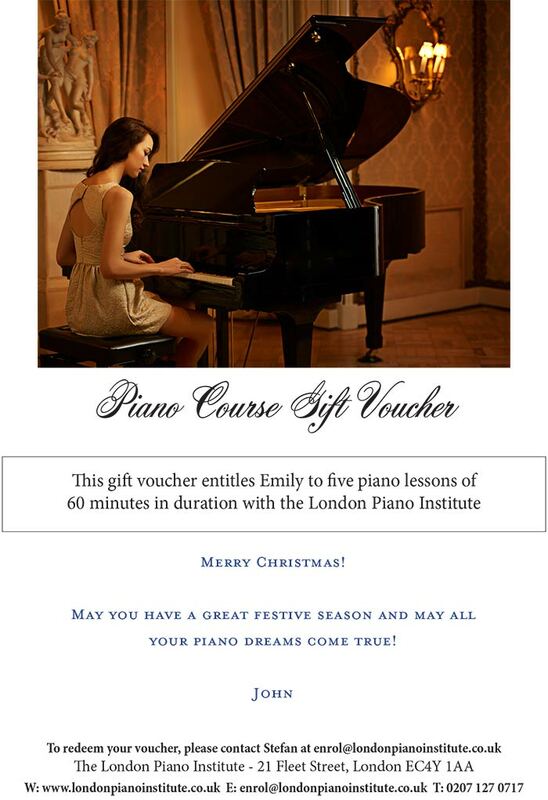 You can then make a purchase directly (via Paypal) at our piano course gift voucher page. We can also help you to purchase the voucher via email. Contact our manager Stefan Joubert at enrol@londonpianoinstitute.co.uk for any questions that you may have! Payment can also be made via a credit or debit card (we use Square Up) or alternatively by bank transfer. You can view the gift voucher options here. Discover the reasons why giving piano lessons as a gift for Christmas is wonderful! Famous people who play the piano! Why is technique so important when playing the piano?